Radio interview of our club's donation at the Stuff-a-Bus event (mp3 file). Post by Rotary Club of Thunder Bay (Fort William). "We were hoping to have something similar to last year, which is around 50, but we're well over 60 this year. Lots of new, creative floats. We had airplanes and dogs and horses, race cars even, so it's pretty exciting." "It's that time of year again! The Rotary Clubs are hosting the 24th annual Christmas parade. " "The United Nations' International Day of Peace is being celebrated in the city today. Thunder Bay's three Rotary Clubs will gather at Marina Park, to commemorate the global goal for peace." 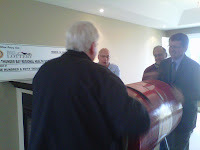 "The Fort William Rotary Club is donating 80 brand new mattresses to the Shelter House. Executive Director Patty Hajdu says it's a 20-thousand dollar donation. Hajdu says the old mattresses were well past their due date and badly needed to be replaced." "The Rotary Club of Thunder Bay is launching its 28th Annual House Lottery today. The club is also announcing a five year five-hundred thousand dollar commitment to the hospitals cancer care campaign. Club President Dr. Richard Khoury says they expect ticket sales to increase this year to ten-thousand. This years grand prize is a new home valued at over four hundred-thousand dollars. The winning ticket will be drawn at the Canada Day celebrations at the Marina Park." "Rotary House Lottery’s Gordie Garriock announces this year’s draw will take place July 1 at Marina Park." "This years Christmas parade will have a few new changes. Volker Kromm is co-chair of the event and says that one of the new additions will be a giant Christmas card that will show up at the parades sponsor stores. Kids are encouraged to sign the card with a message for Santa. The parade route is also new, being reversed from years past now beginning at the Real Canadian Superstore parking lot. The parade is November 16th at 10am." "Rotarian Kevin Holloway (pictured with guitar) led a chorus of Give Peace A Chance at the dedication of the new Rotary Peace Pole at Prince Arthur's Landing on Saturday." "Fort William Rotary's Bob Hookham (left) and Gordie Garriock hold the winning ticket Monday in the annual house lottery draw." "Piritta Naynki (from left), Sari Kurttila, Antti Hartikka and Sara-Kaisa Konttori on Tuesday try out the mayor’s chair at city council chambers. The group, which also includes Juha Risteli, is in the city on a Rotary International-sponsored group study exchange." "The Rotary Clubs of Thunder Bay are hosting a group of young professionals from Finland. The Rotary's Jill Zachary says it's part of a yearly exercise where teams from one country stay with Rotary families in another. The group will be visiting the district for the next five weeks." 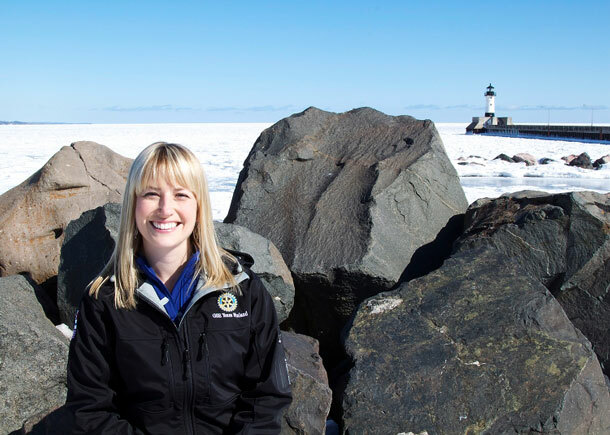 "Kathryn Lyzun is headed to Finland A local young professional is heading to Finland for an incredible experience through the Rotary Foundation Group Study Exchange (GSE) program. Kathryn is sponsored by the Fort William Rotary Club in Thunder Bay." "For the 27th year, the Thunder Bay, Fort William Rotary Club has launched its House Lottery Draw. The event took place in the $415,000 house on Sunflower Drive, overseen by Gordie Garriock, Media/Communication Coordinator, who opened the ceremonies with an introduction to the project." "Jenna Skirving and her sister Cheyna are wrapped in a blanket as they enjoy the Rotary Christmas Parade and collect treats from parade participants." "Santa is coming to Thunder Bay early again this year. The big guy will be here in time for the annual Rotary Christmas Parade, taking place Nov. 17." "The Salvation Army is swimming with cash after raising a quarter million dollars for disaster relief efforts from the community. The donations included 50 thousand dollars from the Fort William Rotary Club." "Rotary Club of Thunder Bay (Fort William) president Fiona Skogstad is flanked by Thunder Bay Coun. Paul Pugh, left, and campaign chairman Bob Hookham prior to Thursday’s launch of the annual Rotary House Lottery. " "Today is the 21st annual Christmas Parade. The parade is being hosted by Thunder Bay Rotary Club, with help from Shelter House volunteers and Lakehead University students. The parade starts at the Thunder Bay Community Auditorium the moves down Memorial Avenue to the CLE grounds, where kids can meet Santa Claus." 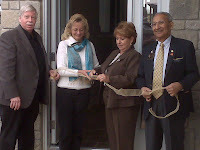 "The winner of the 2011 Rotary House Lottery is from Thunder Bay. Gilbert Kerr of Grenville Avenue had his ticket pulled on Canada Day. Proceeds from the draw go to local charities." "Mayor Keith Hobbs hands off the winning Rotary House Lottery ticket he selected for the Fort William Rotary Club’s 25th annual Canada Day draw. The winner, Gilbert Kerr, was not in attendance at the Travelodge Airlane where the draw took place Friday afternoon." "Two Thunder Bay residents are a little richer thanks to Rotary. Karen Lauzon won 25 thousand dollars and Dee Bodnar won five grand. The two will get their checks next week. Each week leading up to the House Draw on Canada day a cash draw will be made. Rotary is giving 75 thousand dollars in early bird draws." "On Tuesday, still confined to a wheelchair, Tozer was praising the hospital for its efforts to add a second cardiac catheterization lab, thanks in part to a $150,000 donation made by the Fort William Rotary Club through its annual house lottery draw." "The Regional Health Sciences Centre is receiving a huge boost thanks to the Fort William Rotary Club. President Dave Knudsen says they donated 150 thousand dollars to the hospital so the new cath-lab can be equiped. The money is the direct result of the proceeds from the club's house lottery. The new lab will give patients 24/7 access to emergency angioplasty." "Over the past 25 years, the Fort William Rotary Club has raised nearly $4 million through their house lotteries and they plan to add to that again this year by raffling a 1,729-square foot, three-bedroom home in Sherwood Estates." "The Rotary Club is back with it's annual house lottery. Organizer Gordie Garriock says like always thousands of dollars will be doled out to local charities.This year the home being offered is worth 350 thousand dollars and is located in Sherwood Estates." "Spectators braved the cold and lined Memorial Avenue for the 20th Annual Rotary Clubs of Thunder Bay Christmas Parade. The crowd was treated to a variety of floats created by businesses and organizations all with their own take on Christmas cheer. Many onlookers were especially looking forward to seeing Santa Clause cruise down Memorial Avenue." "For the first time in 24 years, a group of lucky winners will split the Fort William Rotary Club's House Lottery grand prize. The main ticket was purchased by a retired employee of Lakehead University, who now lives in British Columbia." "The Fort William Rotary Club officially launched the 24th Rotary House Lottery at a news conference Wednesday. . This year's house is on Hutton Park Drive in Sherwood Estates. Bob Hookham is the Chair of the House Lottery and he said he believes that the 1,700-square foot home is a beautiful prize." "The Fort William Rotary Club is back with its' annual house lottery. Tickets are 100 dollars each and chair Bob Hookham says proceeds go towards several local charity organizations. He says those charities include the Regional Food Distribution Association, the George Jeffery Children's Treatment Centre and the Dew Drop Inn. The draw is taking place July first." "Hosted by Rotary Club, the Christmas Parade will have Shelter House volunteers and Lakehead University students will be collecting non-perishable food items from spectators for Shelter House." "Jill Zachary, president of the Rotary Club of Thunder Bay, gives Stephen Margarit a taste of the German cuisine common to Oktoberfest celebrations Wednesday." "The tickets for the Fort William Rotary Club house-draw lottery are shuffled before Mayor Lynn Peterson reaches in a grabs a winner Wednesday afternoon." "So far the Fort William Rotary Club has been able to sell 5,400 tickets for its annual house lottery, which is still shy of the 7,000 mark." "Rotary member and chairman of this year’s Annual Rotary House Lottery, Bob Hookham, speaks to media Wednesday morning during the launch of ticket sales for the house lottery draw."